The Rotary Club of Charlottesville was pleased to host District Foundation Chair, Juanita Cawley, and Patricia Shafer, Co-founder of the NewGen Peacebuilder program at its meeting on May 9, 2017 where direct service in the Rotary focus area of Peace and Conflict Resolution was highlighted and recognized. Club President Chris Elliott was joined by immediate past club president Brad Bodager and incoming club president Gertrude Fraser in presenting a grant in the amount of $4000 to the NewGen Peacebuilder program in support of its fall program in Charlottesville. Sue Liberman and the grants committee once again diligently combed through the RFPs, to find 8 worthy local and international nonprofits. 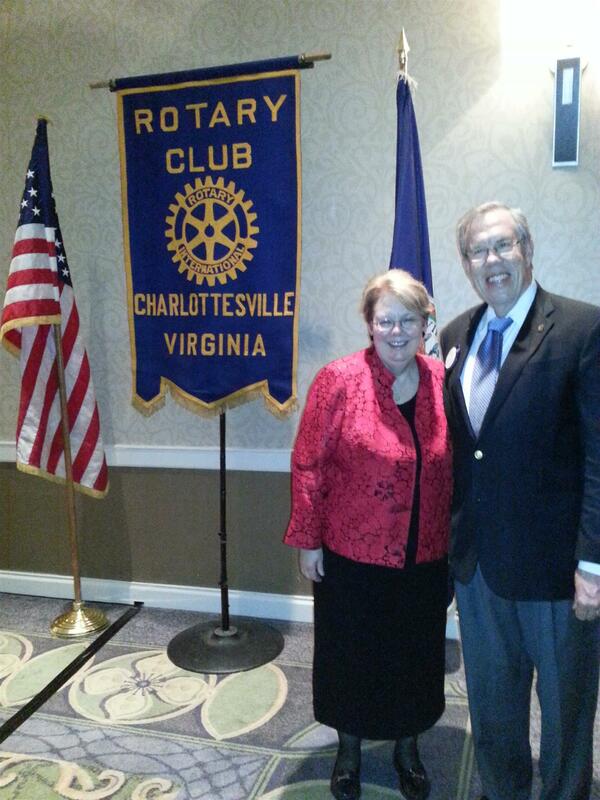 The Rotary Club of Charlottesville awarded $14,000 dollars in grant money. Thank you all for making this giving part of our yearly mission, Thanks to Sue for spearheading it, and thank to all the applicants for doing the important work you do. The James R. Peterson Award goes to a selected club member identified as a dedicated Rotarian in every sense of the word. Members Jim Mustin and Tyler Van Selow were recently welcomed into our club. Tyler brings with him his knowledge as a Wealth Management Advisor at Virginia National Bank. Jim, a retired civil servant, currently heads a non-profit focusing assistance in East Africa. WAHS Robotics team for the First Tech Robotics Challenge. 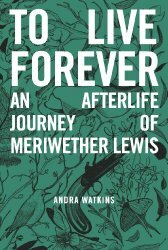 Fellow Rotarian and gifted author Andra Watkins Spoke to our club. 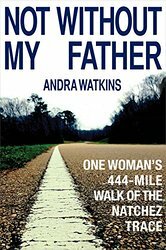 She intertwined a story of a 444 mile walk along the Natchez trace, with the important lesson of living in the moment. 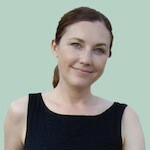 Ms. Watkins reminds us of the value of family, and trying something audacious. To find more information on her books and speaking tour click Here. Pamela Sutton Wallace spoke about the challenges and triumphs of running a major medical center. In her talk entitled “Moving Forward” she reviewed her journey to Charlottesville. The Rotary Club was fortunate to hear such an inspiring story that started in Baltimore and wound thru Washington University in St Louis, Yale, Pfizer, Blue Cross Blue Shield, and Duke University. 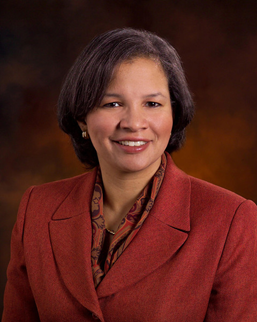 Ms. Sutton Wallace served several positions at Duke University culminating at Vice President of Operations. Coming to U Va in July of 2014 Ms. Sutton Wallace has already made sweeping changes including the raising of nurse wages and hiring more nurses. These new nurses have enabled the hospital to open many needed beds that were previously unavailable. Ms. Sutton Wallace believes “The future of health care is about redesigning ourselves to care for an entire community while honoring the individual patient experience.” The Rotary Club of Charlottesville welcomes The Sutton Wallace family, which includes two daughters at Monticello High School, and Associate Professor Maurice Wallace of the Carter G Woodson Institute for African American Studies a the University of Virginia. Ken Karr had asked me to pass on to the club a really good read in Forbes. It follows well on our last speaker and would encourage you to check it out. Michellle Braden, CEO MSBCoach spoke to the Rotary Club of Charlottesville Tuesday, January 27, 2014. Michelle and her team of professionals are located here in Charlottesville. They train and coach Executives and talented Senior Managers to inspire them to reach their fullest leadership potential. Michelle’s talk inspired an enthusiastic and lengthy Q&A period after she finished. It was a great topic and we all learned a lot. Thank you Michelle for an interesting and timely topic. Ken Karr has once again done a magnificent job organizing vocational month. Here are just a few of the thank you notes we received from students who took advantage of the Dominion Virginia Powers Career day. 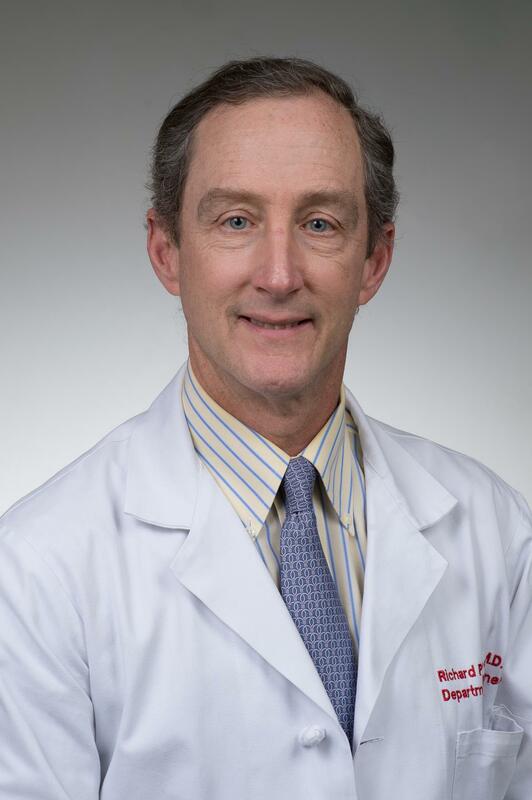 Dr. Shannon, the new Executive Vice President of the University of Virginia Medical Center, spoke to the Rotary Club of Charlottesville on August 26th 2014. He laid out a very clear and dire picture of the nations health care issue. Citing Victor Fuchs emeritus professor of Economics from Stanford in saying "If we solve our health care spending, practically all of our fiscal problems go away,”and if don't " “Then almost anything else we do will not solve our fiscal problems.”​ Dr Shannon brought a solid plan to move forward based on "Pursuing Excellence Quality and Safety as the New Currency". Witnessing first hand the amazing transformation that was made at Alcoa by Paul O'Neill in the late 1980's, Dr Shannon presented that the case that reining in costs, and particularly those associated with safety, harm and over treatment will save our medical system. 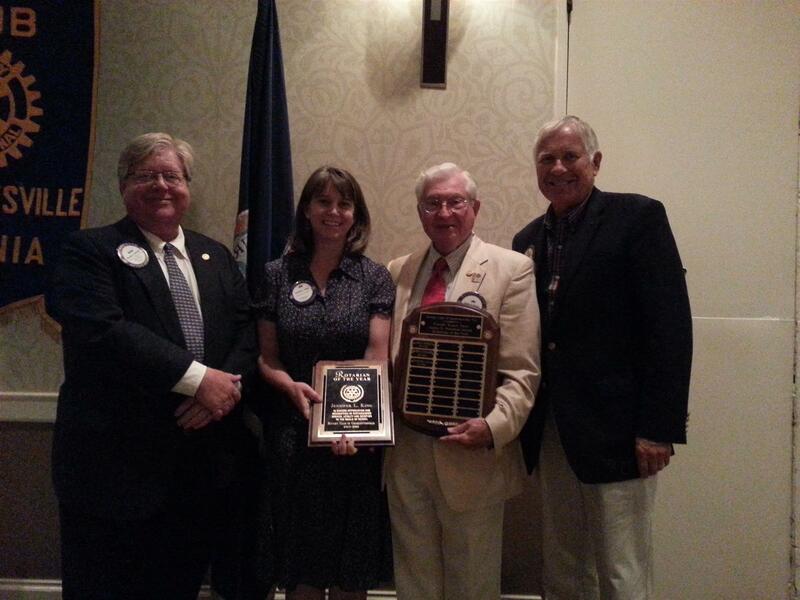 On Tuesday, July 8th 2014, Jennifer L. King was awarded the "James R. Peterson Rotarian of the Year Award for 2013 - 2014" by the Rotary Club of Charlottesville in recognition of her outstanding volunteer service. Jennifer has provided multiple services to this club over many years. She is a long time Board member, serving as president, past president, vice president, secretary (two terms) and treasurer. Currently her excellent work in New Generations and Youth Services has sustained our club activities .Her work with our Japanese exchange student, with the District 7610 Student Exchange Program, our exchange student in Thailand, her work with the Interact Club at Western Albemarle High School, with the Speech contest, Rotary Youth Leadership Awards, Chesapeake Bay students, and Rotaract, are some examples of her Service Above Self commitment to the Rotary Club of Charlottesville. 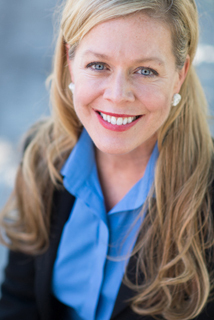 A mother of two, Jennifer still has time for her day job as Senior Vice President and Chief Operating Officer & Chief Compliance Officer of the Chase Investment Counsel Corporation of Charlottesville, Virginia. On June 10th, Gina Mancuso visited the Charlottesville Rotary Club and spoke to members about entrepreneurship in the area. Gina is a self-described “serial entrepreneur” who is running her third successful business at age 32. LoveThatFit is Gina’s current venture. It is a virtual fit and style technology that retailers license so that their shoppers can see actual look, fit and size of clothing when shopping in-store or online after uploading a full body photo. Retailers who license LTF’s ‘Fitting' technology benefit from lower returns, improved inventory control and merchandising while accumulating valuable data including fashion preferences, shopping behaviors and social influence. Gina said that, when it comes to being an entrepreneur, she got her chops by going out and building successful businesses. As a teenager, Gina traded race horses in the European market and, after graduating from the University of Miami, she opened a successful boutique fitness center. LTF is Gina’s third business and has garnered the attention of angel investors and UVA’s Darden iLab Incubator. While Charlottesville may not be poised to become the next Paris or Milan of the fashion world, Gina said that this city is ideal for entrepreneurs looking for a robust collaborative environment. The Rotary Club of Charlottesville presented to University of Virginia President Teresa A. Sullivan an honorary membership and the Rotary International Paul Harris Fellow Award at their meeting Tuesday, May 27th. The ceremony was held at the Omni Hotel. President Sullivan spoke to the assembled Rotary Club of Charlottesville about the opportunities to become a college student and the significant and important values of being a college graduate. In 1905, Paul Harris started a movement that today is one of the world’s premiere service organizations. His creation, Rotary International has quite literally touched the lives of hundreds of millions of people in its global quest to make a difference. Yet few people, both inside and outside of Rotary know much about Paul Harris or how his ground-breaking club developed. Coach London gave an energized and impassioned talk to the Rotary Club of Charlottesville tonight. Linking wonderful personal stories of fatherhood, his time as a Richmond Police detective and his coaching career to a central theme of service and leadership, coach left no doubt of his belief in faith, family and football. A couple things were confirmed, he does check on his athletes being in class, Adam Lambert is the 1st string QB, and Virginia will be ready come the end of summer. Go Hoos. The Rotary Club of Charlottesville helped sponsor the prizes for another Gingerbread Christmas. Mr. Wood is remarkable man. Born and raised in Albemarle he saw at an early age what he wanted. And then he went out and made it happen. Responsible for iconic developments on 29 north such as Fashion Square, Hollymeade Shopping Cenetr and NGIC, Mr Wood has left an a mark on our town. He spoke to the club and not only relateing his story, but also giving some insight into the ever increasing costs of developing projects. Seamore Zhu, a rising junior from Western Albemarle High School and Orion Bloom, a rising senior from the Miller School of Albemarle will present their experiences from the 23rd Annual Rotary Chesapeake Bay Conference to the Charlottesville Rotary Club during its regular meeting on Tuesday, August 13, 2013 at 6:30 pm at the Omni Hotel. 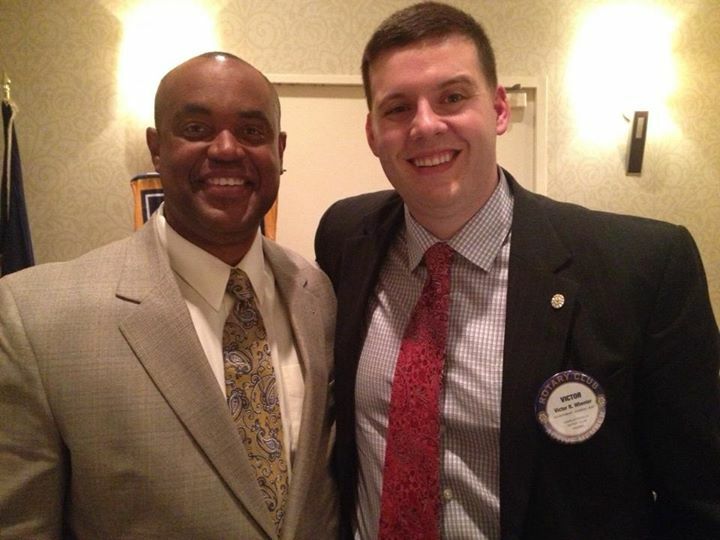 The Rotary Club of Charlottesville inducted two new mebers last meeting. Michael McKee and Kevin Saunders. Please make sure you introduce yourselves at upcoming meetings. Gertrude Frasier gave a fascinating look into happiness. Driven out of her own curisosity about why people are happy, or in her own words why she has struggled with happiness, Gertrude is widely read on the study of happiness. Citing works of Jonathan Haidt and Martin Selgman, her talk was rooted in an acedmics, but brought to life from an honest look at her own life. Again a talk by one of our own club members proves to be one of the best. November 27 Virginia Cruse packed the house for a very special speaker. Jon Peterson, John McCauley, and Rich DeMong along with Rotary members from Albemarle, and Blue Ridge, and five Rotaract Club members mulched new and old bushes that we planted a year ago, planted new bushes by Shelter 2 of McIntire Park and helped install two new benches made by Butch Gridley. The weather was perfect for gardening on Friday, April 12, 2013. WAHS student and RYLA participant Seymore Zhu played piano for the Rotary Club of Charlottesville. The Rotary Club of Charlottesville was proud to welcome the newest incarnation of Rotaract at the University of Virginia. Leon Lin and Narin Limlengart, both members of Rotaract inducted Kevin Lim, Victoria Tran, Shivangi Singh, Yashvardhan Rajgarhia, Jairus Ang, Martin Ying. There are hopes that under the guidance of Chris Wilcox-Elliot and the hard work of the members the club will be a great success story. This week our Club was visited by the GSE Team of police officers from Western Australia, Australia. The four officers are are Sergeant Paul Daly, Constable Aaron Biggs, Constable Jeromy Jones, Sergeant Gerald Murphy, and First Class Constable Taryn Werrett. They regaled the Club with stories of their personal lives, professional lives, and of Western Australia, which is 22 times bigger than Virginia. Jim Berry was the team leader for the Piedmont Rotary Council. Jim Berry and Jim Peterson drove the GSE team down from Northern Virginia and more than halfway to their next Club in Tappahannock. Tom Dunnells, Duane Snow and Rich DeMong hosted the Australians and took them to and from their many stops during their stay in Charlotteville. The GSE team spent time with one of the local police departments (UVa, Charlottesville City, or Albemarle) during their Vocations Day. John Griffin, Michael Semanik, and Jim Peterson escorted and drove the Australians on several of their excursions. Finally, Jeff Gould talked to part of the GSE team about Drug Court while the others visited with the Executive Director of the Shelter for Emergencies. You can follow the GSE Team on Facebook (RotaryGroupStudyExchange2013Virginia). They have posted some great photos and blog posts. Law enforcement Changes in 30 years. Mike Milnor of the Virginia State Police and a Professional licensed polygraph investigator walks us through 30 years of Law Enforcement. From chase till you wreck to polygraph. Our past president Gary Selmeczi makes sense of long term care planning and shows off a new WCBR wing. The Rotary Club of Charlottesville Hosted its Annual Salvation Army Bell Ringing December 11th. 5 tips to healthy Living. Avoid processed foods and eating out. Copies of her handouts can be found in the documents section of the web page. We are proud to Welcome Ms. Cynthia Neff to the Rotary Club of Charlottesville. Directions: From town, Route 250 East, turn left at Shadwell onto Route 22. Proceed 5 miles to Cismont – country store and Exxon gas station on left. At this point route 22 forks off to the right and route 231 goes straight ahead. Stay straight on 231 and proceed 2.5 miles to Linden Lane Farm on right. Please bring a dish of food (entrée, vegetable, dessert, etc.) and folding lawn chairs if possible. Also, you may want to bring baseballs, gloves or other sporting equipment for your children. Please RSVP, with names of guests and expected side dish to RichDeMong@hotmail.com. Please RSVP, with names of guests and expected side dish to . Fund Raiser and efforts of local Rotary bringing water to a school in Africa. Tom Dunnells made a three minute presentation at the District Conference that was so good, we made him do it again. Tom showed what Rotary is doing for the people of Limpopo. Native music accompanied lovely photography. The effort of our Club and others has helped bring clean water and sanitation to Tlhophane School in the Northwest Province of South Africa. John Rogers CFA, of the Charlottesville Based CFA Institute spoke on Tuesday the 10th of April. The CFA is moving into the majority of the Old Martha Jefferson Hospital on Locust Avenue. John gave a brief but fascinating history of the Institute, and it's mission. To learn more please visit this link.